We're kicking off the "Second Saturday" Campfire Jams at the Old Mill this Saturday (7:30 start) with 3 generations of blues masters. Ken Whiteley was already blues royalty in Toronto when I arrived in 1990. Then shortly after I arrived I was hearing about a young blues band called the Sidemen who were making a big buzz. Paul Reddick has since established himself as the unofficial "poet laureate" of the blues - and still plays a helluva harp. Then there's Sugar Brown, who crashed onto the local blues scene a few years back with an intense sound which was a little "raw" for me in the beginning but which really grows on you with repeated listening - and downright addictive as I've had the opportunity to play with him on a few occasions. I've also played with Paul and Ken at different times so this will be a great get-together. Unlike the previous campfire jams in clubs, this "all-star" jam brings together the top blues players on the scene today in a great venue with a beautiful grand piano. With musicians of this caliber, it will be a jam to remember. The Blues Campfire took a bit of a hiatus for the last couple of years but I've been lured back to present an "invitational" jam, with people getting paid! Wow, is that radical these days. I went from paying my guest $50 bucks when I did my Thursdays at the Tranzac, then it was complimentary beverage for the jammers at Hwy 61, until we took it to the Gladstone where jammers got nothing. You can see why I ran out of steam. A lot of people, even some musicians, don't like the  jamming thang. It does not really fit into a career-development strategy (It's never done much for my career development but I just love to jam - especially when I get to play bass),  I remember asking a busy guitar player to jam when I first got to Toronto and he hummed and hawwed a bit and I realized that when musicians got together in this town, it was usually a "project." But we're going to raise the ante with this series at the Old Mill - I hope we get an audience and I hope they get us. Thanks to Winterfolk for bringing me in to do a Blues Campfire at their festival (I also got to do a solo concert which was packed and appreciative). The Winterfolk Campffire jam featured Mr. Rick, Kim Doolittle, Julian Taylor, Danny Marks and I got to meet larger-than-life bassman Jerome Tucker plus I got to jam for the first time with a bona fide Canadian Blues treasure, David Essig. 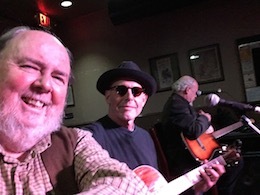 David, Rick and I also did a blues fingerpicking workshop (pictured) and passed along a few tips and tricks to the many guitarists in attendance. Well it looks like we will be gigging next week! And lo and behold I'm not waiting till the day before to get the word out. Next Thursday, it's a house concert in a great room that Ann Kerr-Linden has built in her house near Spadina & Bloor - perfect for storytelling  and music. She has asked for RSVPs so she can prepare - there will be tea and cookies on the break. And when you reply, feel free to make a request - I'm still putting together the set list and could use a little guidance. I have some great memories doing a bunch of house concerts on the Home Routes circuit in Manitoba and Sask with Allan Fraser. I hope they can keep that great initiative going (thinking of you, Mitch). And I'm happy to announce the return of the Blues Campfire (literally). Bev & Howard had borrowed it for the late night jam on Harlan's Porch at FMO and handed it back at an event at a record label office just down the street. It was a private showcase for Ann Vriend who just won the Cobalt Prize for songwriting but even if she never wrote a mumbling word she has a voice that's one-in-a-million. Now I'll be firing up the Campfire for a jam at the Winterfolk festival (Sunday, Feb 19 3pm) and then for a residency at the Home Smith Bar in the Old Mill - better known as a classy jazz venue with a beautiful grand piano (which we will be making good use of). See the sidebar for all the great performers who will be joining me. I'm noticing way less activity on the list serves (maple blue, maple post) and wondering if it's getting a little redundant to post gigs there. It was great when it was the only game in town but now there are so many ways to spread the word. I remember people would end their posts with "MOATM:" (Music On At The Moment). I loved that. 2... Luke says it was a bit of a "fun" side-project for these two but I doubt they'll be trying to get gigs on the blues circuit (where, as they say, there's "hundreds of dollars to be made"). Other (non-blues) friends who were nominated include Brenna MacCrimmon (Turkwaz), Chris McKhool (Sultans of String) and Jesse King, aka Dubmatix. You can see the complete list at www.junoawards.ca (http://www.junoawards.ca/) . The Canadian contingent at the International Blues Challenge in Memphis made us proud this year. Dawn Tyler Watson (backed up by the Ben Racine Band) won first prize and it must be extra sweet for DTW who just came out of a triple-bypass heart operation. Amazing. January was chock full of great blues - imagine the 30 top blues bands in the country all under one roof - that was the Blues Summit. Of the 250 delegates there were probably 50 or so "talent buyers" and for two days they had to sit at tables in the hotel ballroom while artists and managers skipped from one table to the next to make their "elevator pitch." After 5 minutes, Alice would announce that we had to move to the next table. Kind of speed-dating for gigs. I ran into a few people who liked what I do and maybe I'll get a gig or two. From my experience, everybody at these things already knows who they want to book and if there's any spots left after that they will go with the artists who their colleagues are keen about. I had more success as a "buyer" and was able to line up some great guests for the Blues Campfire at the Home Smith Bar. I skipped out of the Sunday panels to hear Harpdog Brown and Steve Kozak sitting in with Dr Nick at the Rex and Harpdog remains a big favourite of all the showcasing artists. I saw him play several times while he was in this area and he's got that "larger than life" thing going for him. He plays great harp and his guitar player, Jordy, is my kind of guitar player. Guitar players ruled at the Summit - one night it was just one guitarslinger after another, and even though it was the best players in the country, your eyes started to glaze over after awhile. One standout solo was former child prodigy Ricky Paquette playing with Angel Forrest (and now sporting a mustache!) On another night I heard some grumbling that some of these bands would be more at home in a Holiday Inn lounge. It's ironic that everybody strives to be unique and yet the more generic you sound, the better chance of getting the gigs. One artist I was impressed with, though I still haven't heard her play, was Chuckee Zehr. What a neat lady and when I asked around about her piano playing I heard nothing but high praise. I'm going to hear her play even if I have to go to Stratford! My favourite moment in the whole summit week-end (probably because it's the only chance I got to play) was a late night jam/guitar-pull in Brian Mortimer's hotel room. Great to watch the "new kid on the block," Mark Crissinger swapping licks with one of his heroes, Jack de Keyzer. Then there was Steve Strongman and Paul Deslauriers pulling out unlikely tunes that were definitely not in their "wheelhouse." Lots of laughs. The Minneapolis-based label Roaratorio Records has released a three-song vinyl EP by the legendary Canadian duo of Allan Fraser and Daisy DeBolt. The disk showcases the majestic David Owen tune “Zero ± 22 and Holding (Flight Of The Light Air Force)”. The  record is a follow-up to the 2016, 2-LP release “This Song Was Borne.” The albums together are a retrospective of Allan and Daisy’s musical partnership which dated from 1969 to 1975. Both are available online from www.roaratorio.com and on iTunes. The disks include a bonus download code with purchase. Lots on my "to-do" list. I started to make a proper video of "Ramene Moi Demain" with more beautiful (hi-res) pics by lyricist Daniel Racine. We also worked together on an English translation and I'm now learning how to make subtitles. Stringbuster (and the Robot Johnson Project) are inching forward but it's always pushing the capabilities of my little Macbook Pro, especially when you're trying to use state-of-the-art machine learning and artificial intelligence. It's one step forward and two steps back. We'll get there and it will be...HHHHHUGE! That's it for now. There's more commentary and some great video clips from the Summit on my blog (http://torontobluesdiary.blogspot.com/) . Check out my Facebook musician page (http://facebook.com/brianblain.musician) and give me a "like". Thanks for subscribing to the (mostly)monthly Blainletter. If this is one-too-many emails for you, you can unsubscibe at the bottom of the message. Anyway, most of this content is culled from my blog, torontobluesdiary.com so you can always read it there. I call it my "living" album because it started life as a solo "live" recording with bassist George Koller and has now been "sweetened, stacked, mixed and mastered" with new instrumentation on all the songs. It starts with New Orleans marching horns from Alison Young and Colleen Allen on "Forgotten",  “Alice“ gets violin and banjo from Drew Jurecka and Tim Posgate. There's a reggae percussion workout with Trinidadian Wayne Stoute and the wonderful Michelle Josef, some sweet slide from Harry Manx on the French tune, barrelhouse piano from Toronto expat Patrick Godfrey and organ grooves galore from Australian B3 sensation Clayton Doley. "The Ghost of Clinton's Tavern" is a full-tilt electronic ambient remix by my son the DJ. You won’t believe that these are the same basic tracks that I released on the original "New Folk Blues"